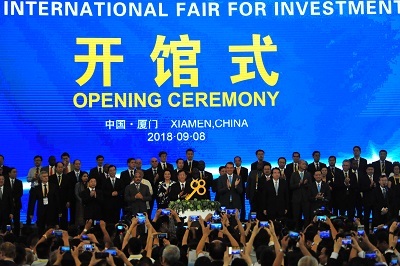 The 2018 China International Fair for Investment & Trade (CIFIT) kicked off in Xiamen, Fujian province on Sept 8, which will run through Sept 11. The four-day event attracts more than 100,000 business people from over 800 commercial associations and 4,000 companies representing more than 110 different countries and regions, over 300 of which are international organizations, Fortune 500 companies and other international companies. Focusing on investment on a national and international scale, in particular on across the Taiwan Strait and countries involved in the Belt and Road Initiative, more than 80 forums and conferences are expected to take place. This year's fair covers an exhibition area of 130,000 square meters with 6,000 booths in 16 special exhibition areas, such as modern service industries, and cross-border e-commerce and emerging industries. More than 150 project matchmaking activities will be organized and more than 2,00 projects are expected to find their investors during the event. Last year, CIFIT saw the signing of 1,577 investment projects worth 532.7 billion yuan ($77.93 billion) and drew the attendance of more than 100,000 representatives of 4,000 domestic and foreign companies, 700 business groups and 40 multinational corporations from 107 countries and regions.